LHASA -- The death toll has risen to seven, and one person remains missing, as a result of the worst snowstorm on record in Tibet, local authorities said Thursday. The seven people killed either frozen to death or were crushed by collapsing buildings. About 144,400 heads of livestock died in the storm, which also knocked out telecommunications and traffic in parts of Shannan prefecture. In Lhunze County, 1,348 people stranded by damaged buildings or blocked roads had been rescued, the county government said. Rescue operation for the remaining 289 trapped was still underway. The worst-hit county had 36 consecutive hours of snowfall from Sunday, with an average snow coverage of 1.5 meters. Four people died and one remained missing in the snowstorm. The rescued people have been moved to other villages, sleeping in schools or government buildings. 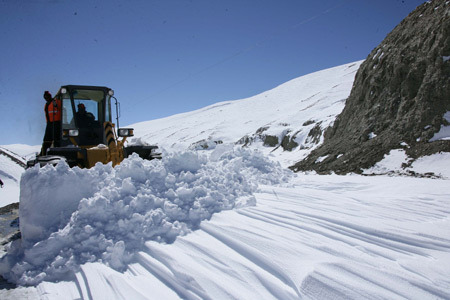 A road linking Lhunze to Cuona County reopened on Thursday after 63 hours of snow clearing efforts of armed policemen and transportation staff. Cuona had been isolated from the outside for three days due to the road blockage. The Tibet regional civil affairs department has allocated relief materials such as clothes and tents to the affected areas.